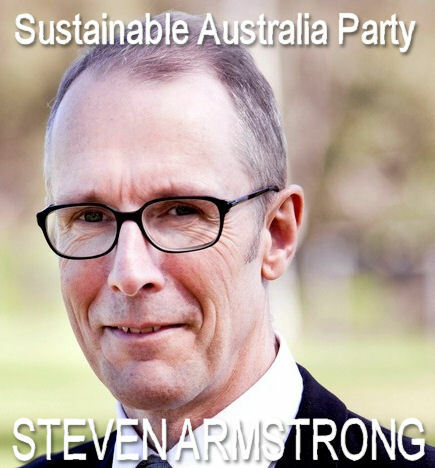 Steven Armstrong is a prospective Sustainable Australia Party candidate for the upcoming federal elections. He has run before and has a history of hard work on the issue of sustainability and the unsustainable problem of our rapid population growth in Australia. His political experience and skill has grown along with his experience. Although Steven has financed previous candidatures, the cost of merely registering to run in the election has suddenly leapt from $350 to $2000 under the LNP coalition. This can only be in order to reduce democratic opposition. So please consider helping Steven in his gofundme campaign! He needs $2000. Hi, my name is Steven Armstrong. Soon we will be having an Australian General Election. I have been pre-selected to run in the Division of Macnamara for the Sustainable Australia Party. Politics is an expensive thing to undertake. The LNP coalition have increased the deposit (democratic entry fee) from $350 to $2000. They fear an alternative voice of the people and seek to silence us. Show them that they will fail. This campaign will allow me to give a choice to those of us that seek a better and sustainable Australia. Sustainable Australia is a community movement from the common-sense political centre advocating for an economically, environmentally and socially sustainable Australia. This includes secure jobs, affordable housing, better planning and a sustainable environment for all Australians. We are a group of committed Australians from backgrounds in business, science, the environment, health, academia, demography, politics and many other ordinary citizens; from World War 2 Diggers to migrants born on every inhabited continent on Earth. And that's without counting the temporary entries. It's an invasion, coordinated by our 'leaders'. "Australia's immigration rate has surged to a new record high with more than 115,000 permanent arrivals in just one month. The Australian Bureau of Statistics released new immigration figures on Thursday, hours after Prime Minister Scott Morrison called an election for May 18. The property industry have the game sewn up. They are on the teat of the government which is feeding them a guaranteed stream of customers. It's a sinecure!